One of my greatest inspirations in the fantastical world of crafting and DIY is my grandmother who passed away in 2012. She was always carving, making jewelry, little crafty decorations (90% of them Christmas related), and anything else that made the world around her unique. As a newlywed to a Broadway actor and chorus man, she traveled the US with his various productions before settling down. They also took frequent trips around the world, so no matter where she went she gathered things that inspired her and ideas for her own crafty projects along the way. One thing she had a great eye for were gorgeous mirrors. There were several mirrors all over her house including a green vine mirror my sister inherited. This one here is a special inherited piece of mine that she created out of a collection of seashells. It's about one foot in diameter and an inch and a half thick including the shells and base. 1. Cut the piece of cardboard or wood to the desired shape. 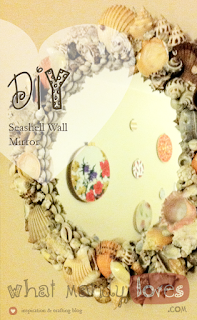 Leave space around the mirror where the shells will go. 2. Hot glue the mirror to the cardboard or wood. 3. Hot glue each shell into place around the mirror's edge. Try and glue as close to the ugly edge as possible. 4. 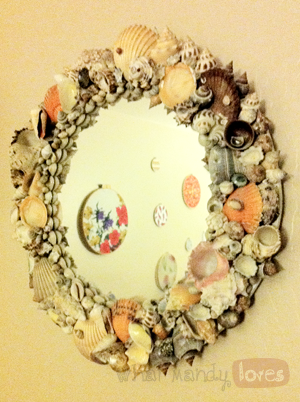 Layer as many shells as you wish but mind it's weight (too heavy = messed up wall & broken mirror when it falls). 5. Carefully lift from the base onto layers of newspaper. Spray or paint on gently the clear matte adhesive over the shells. Avoid streaking the mirror glass by covering it with a cloth, newspaper, or paper towel taped down before applying the adhesive. 6. Remove covering from mirror glass. Let the entire mirror base and shells dry on a flat safe surface for at least twenty-four hours. If you've added too much adhesive keep the mirror cover on until dry. 7. Once dry, add a fastener to the back of the base near the top-center of the mirror. This mirror was hanging up in my grandmother's bathroom for years and held up against the mist of the shower like a champ. Sadly I was unable to get more details about the mirror before she died, but she was a hoarder of could-be craft supplies from everywhere. It's anybody's guess where these particular shells came from. 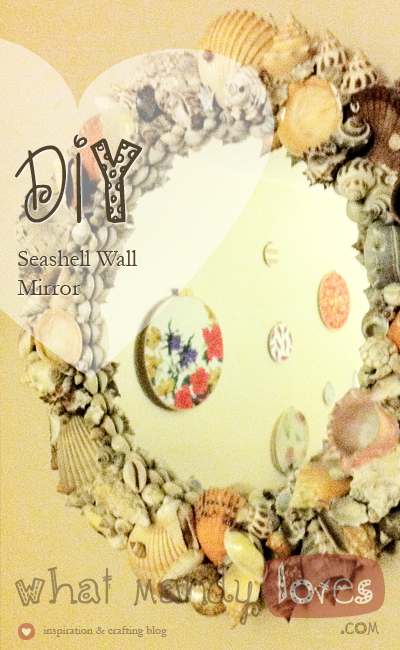 All I know for sure is that she had a giant collection of real shells she taped into for this mirror project. I'm so glad I was able to inherit this unique piece that's held up the test of time. Tell me what you think! Are there better ways to create this look? This doesn't have to be just for mirrors either; glue shells onto picture frames, dresser drawers, magnets, pins, office accessories, etc. Try it yourself and send me pics in the comments!